The game of roulette is played by spinning a small ball on a round wheel with thirty-eight (American Roulette) numbered slots. 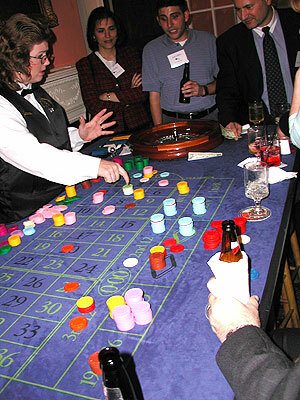 The object of roulette is to correctly predict the slot in which the ball will land. By predicting the right number, you earn a payoff on your bet. The size of the payoff depends on the type of bet that you placed. The types of bets are determined by which combinations of numbers you want to put your bet on. The fewer the numbers that are included for the particular bet you choose, the lower the odds that you will actually win, but the payoff on your bet is higher if you do happen to win. The combinations or types of bets listed below are the options which are offered at the roulette wheel and range from including only one of the available numbers (Straight Up) to including 18 of all the possible numbers that can be hit (Red/Black, Even/Odd, High/Low). You can place nine different kinds of bets on the roulette table. Each type of bet covers a certain range of numbers, and each type has its own payoff rate. The short lines of three numbers each are called rows on the board, while the longer lines, each holding twelve numbers are called columns. The first six types of bets are all made on the numbered space or on the lines between them and are called inside bets, while the last three types are made on the special boxes below and to the right of the board and are called outside bets. Straight Up: Place your chips directly on any single number (including zero or double-zero). Street Bet: Place your bet at the end of any row of numbers. A street bet covers three numbers. Corner Bet: Place your chips at the corner where four number areas meet. All four numbers are covered. Five Bet: This bet can be made in only one place and covers five numbers: zero, double zero, one, two and three. Line Bet: Place your chips at the end of two rows at the intersection between them. A line bet covers all the numbers in either row, for a total of six. Dozen Bet: Placing a chip in one of the boxes marked “1st 12”, “2nd 12”, or “3rd 12” covers those twelve numbers. Red/Black, Even/Odd, High/Low: A chip placed in one of the six boxes at the bottom of the board covers the half of the board described in that box. (The zero and double zero are not covered by any of these boxes). Each box covers eighteen numbers. Identifying games of chance that have a very low house advantage should be the first goal of any strategist or advantage player. A good target is a house advantage of 2.5% or lower. You cannot change the house odds! I don’t care what strategy you have for which game you play. The house odds are set and there is nothing you or I or anyone else can do to change those odds. If you play games that have a low house advantage, however, and you play them correctly to make sure you are getting the lowest odds possible. (Red/Black, Even/Odd, High/Low). These bets offer the best player odds when played correctly as will be described in the next section. Think about it, every bet you make on these selections has a 50/50 chance of winning minus the odds of the zero hitting. All other roulette betting selections decrease your odds of winning and where as the payoff is better; your chances of a short term loss drastically increase, which adds to the long term advantage of the house. You now know what type of roulette and what type of roulette bet to make for maximizing your chances of consistently winning. Now I will explain the method in which to place your bets to guarantee you get the best odds possible. Many people mistakenly believe that you should stick with one selection and continue to bet on that selection, thinking it must hit 50% of the time with the exception of the few times the zeros hit. And they are correct for the long term. Over a sample of hundreds or even thousands of spins, the probability will even out to hitting 50% Black and 50% Red, 50% Even and 50% Odd, 50% High and 50% Low. But also over time that zero keeps coming up every now and then and in effect scrapes the house take off the top, resulting in an overall loss for either bet selection. A winning player must take full advantage of the short term trends to win consistently. Another common misconception is that after a certain number of one side hits, the other side becomes ‘due’, bound to hit as the laws of probability demand. Wrong. I can understand how a lot of people can make this mistake; it seems logical. If Red has come up for the last 10 spins, black is bound to show up on the next spin. I have been witness to the same color coming up 21 times in a row! What may seem logical, in this case, is really a common misperception that adds to casino profit. Playing the trend to maximize your short term advantage is the only way to play roulette for a realistic profit; it is really quite simple. If you look at the roulette history board and the last color that hit was red, then your next bet should be on red. Conversely, if the last color that hit was black, then your next bet should be on black. As long as the trend continues, you continue to win. The only time you lose is when the color switches or the zero comes up. It works the same way for Odd/Even and High/Low betting. This is the only roulette betting strategy that will provide you with the very important minimal house advantage of 2.1% in the short term.